For years, we’ve heard that eating more dietary fiber delivers a range of health benefits, from greater weight loss to better blood sugar control to lower cholesterol levels. Now, scientists increasingly suggest that much of the power of fiber is due to its impact on the human microbiome—our internal colonies of bacteria. Eating a wide range of high-fiber foods appears to nourish the microbiome in our digestive tracts. And when our microbial friends are well-fed, it seems we are less prone to health woes like heart disease, diabetes and even depression. Certain strains of bacteria can convert the fiber we eat into compounds such as short-chain fatty acids. These compounds may have a beneficial effect on our health by creating an environment that is hospitable to good-for-you organisms and less friendly to undesirable bacteria. Research shows that the microbiome profiles of people on a plant-heavy diet tend to favor protective species of bacteria in the gut at the expense of harmful ones. On the flip side, a diet low in fiber, as many diets full of processed foods tend to be, may promote the loss of certain beneficial species of bacteria in our guts over time, and it can be hard to get them back. To get your fill of bug-nurturing fiber, eat plenty of vegetables, fruits, beans, lentils, seeds and whole grains. This berry-good salad will make it much more delicious to start roughing it. It’s the perfect make-ahead lunch option. Serves 4. Place lentils in a medium-sized saucepan and cover with about 2 inches of water. Bring to a boil, reduce heat, and simmer until tender but not mushy, about 20 minutes. Drain lentils and place in a large bowl; let cool. In a separate saucepan, bring quinoa and broth or water to a simmer, reduce heat, and simmer covered until quinoa is tender and water has been absorbed, about 12 minutes. Set aside covered for 5 minutes and then fluff with a fork. Add to bowl with lentils. 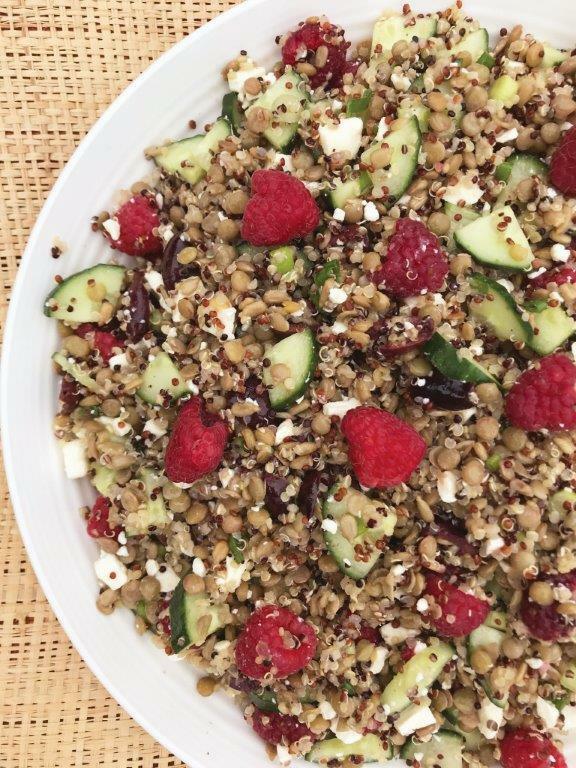 Place raspberries, cucumber, mint, scallions, olives, feta and sunfl ower seeds in the bowl with the lentils and quinoa; toss gently to combine.